Earth was polluted almost to death once, long ago. Humans aren’t the first life forms to exert a global influence over climate, or dominate the chemistry of the atmosphere, oceans and land surface. Between two and three billion years ago, a new, rogue strain of bacteria evolved that would overturn the biosphere of the entire planet. Oxygenic photosynthesis evolved, sometime between 2.9 and 2.4 billion years ago. That’s great, you might say. Photosynthesis makes the flowers grow and the bees buzz. Well, now it does. But when oxygenic photosynthesizers evolved, things weren’t so pleasant. These rogue bacteria developed a trick that was new, back when this ancient world was not quite so ancient. Oxygenic photosynthesis does just what it sounds like it does… it makes oxygen, using sunlight. Three billion years ago, that amounted to poisoning the world. At that time, at least a billion years had passed in a world where life was young and thriving. Bacteria permeated the seas, living and growing in an ocean of warm water, beneath of sky devoid of even a trace of oxygen. On the Earth of 3 billion years ago, nitrogen and carbon dioxide dominated the suffocating, reducing atmosphere. Into such air cyanobacteria began to pump toxic oxygen, a corrosive, reactive gas that ripped apart every organic molecule in its way. Today we think of oxygen as benign, but only because our cells are adapted to it. In the Archaean Eon, over two billion years ago, oxygen released by cyanobacteria was as lethal as chlorine was on the battlefields of World War I. Cyanobacterial mats, like clots of scum on polluted ponds, would have covered ancient bays and estuaries, belching a tide of lethal gas that sterilized every other cell it touched. 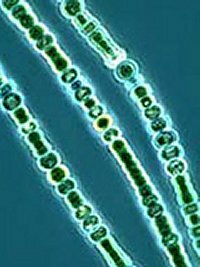 History was sealed: cyanobacteria would rule. When, exactly, did this happen? The answer matters, and new data from B. Rasmussen and coworkers show that the origins of oxygenic photosynthesis on Earth were probably much more recent than most geologists thought. New measurements of organic residues found in Archaean rocks challenge prior results, and suggest that cyanobacteria evolved much later… around 2.4 billion years ago, which was just before Earth’s atmosphere changed wholesale from a reducing to an oxidizing environment. Who cares? Geologists do. Because prior work painted a story of cyanobacteria evolving much earlier, nearly five hundred million years earlier. This model would have had oxygen-belchers evolving a long time before oxygen started building up in the atmosphere. Why then the delay, between appearance and global oxygenation? One explanation would have had cyanobacteria dominating in scattered, isolated islands of alien ecology, surrounded by oxygenic dead zones. The new data suggest nothing so gradual, but rather a world where a new, freakish metabolism evolves and rapidly throws the planet into ecological chaos. As these new invaders proliferated, oxygen gas would have rolled out over a helpless world, rusting rocks and uprooting a chemical environment that had been stable for a billion years. It was death, worldwide. But it also heralded a new order that would one day lead to multicellular life, animals, and the internet. Without oxygenic photosynthesis, our planet may never have evolved complex animal life. Oxygen is toxic to the unready, but oxygen is also a powerful fuel to drive metabolism, allowing faster growth and faster evolution. All of which would never have happened, if a particularly curious trick of biochemistry had never evolved in the first place. It wasn’t inevitable… it took a billion years to appear, after all. The take home lesson? Evolution is contingent, and one successful mutation can change a planet. It’s something to keep in mind, as we pursue our search for life-bearing worlds elsewhere in the universe.